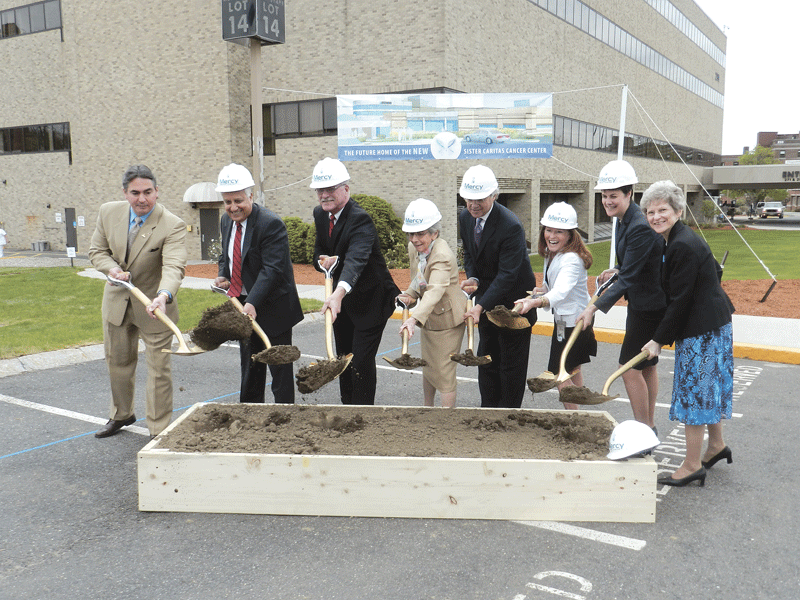 Mercy Medical Center recently held a groundbreaking ceremony for a $15 million expansion of the Sr. Caritas Cancer Center. Pictured from left are Springfield Mayor Domenic Sarno; Mercy surgeon Dr. Mohamed Hamdani; Daniel Moen, president and CEO of the Sisters of Providence Health System (SPHS); Sr. Mary Caritas, Sisters of Providence; Dr. Philip Glynn, Mercy’s director of Medical Oncology; Dr. Catherine Carton, Mercy’s medical director of Radiation Oncology; Kate Kane, chair of the SPHS board of trustees; and Sr. Kathleen Popko, president of the Sisters of Providence. 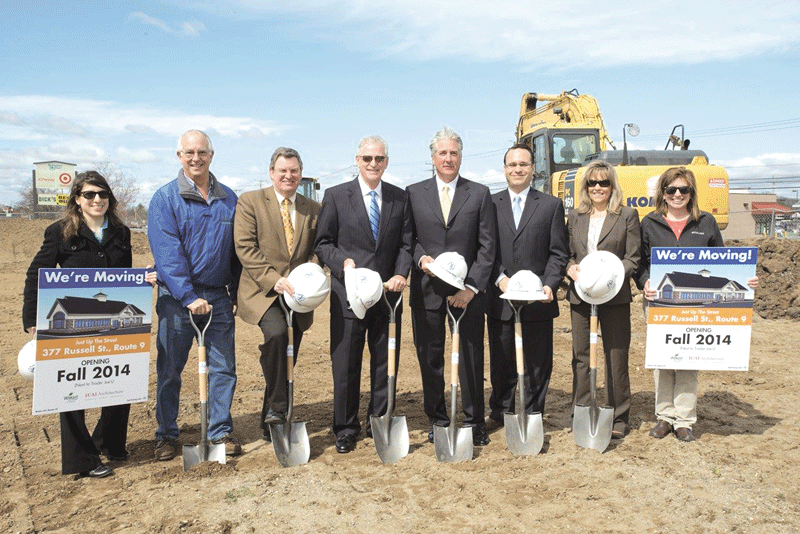 Florence Savings Bank (FSB) recently broke ground on its new Hadley branch. Pictured from left are Amy Lewis, HAI Architects; Jonathan Wright, president of Wright Builders; Rick Katsanos, president of HAI Architects; John Heaps Jr., president and CEO of FSB; Robert Borawski, chairman of FSB; Toby Daniels, vice president and marketing director of FSB; Sharon Rogalski, senior vice president and senior retail executive at FSB; and Karen Soucie, HAI Architects. More than 125 people turned out at the Log Cabin Banquet and Meeting House on May 14 for “Common Threads: an Evening of Empowerment” to benefit the Dress for Success program. 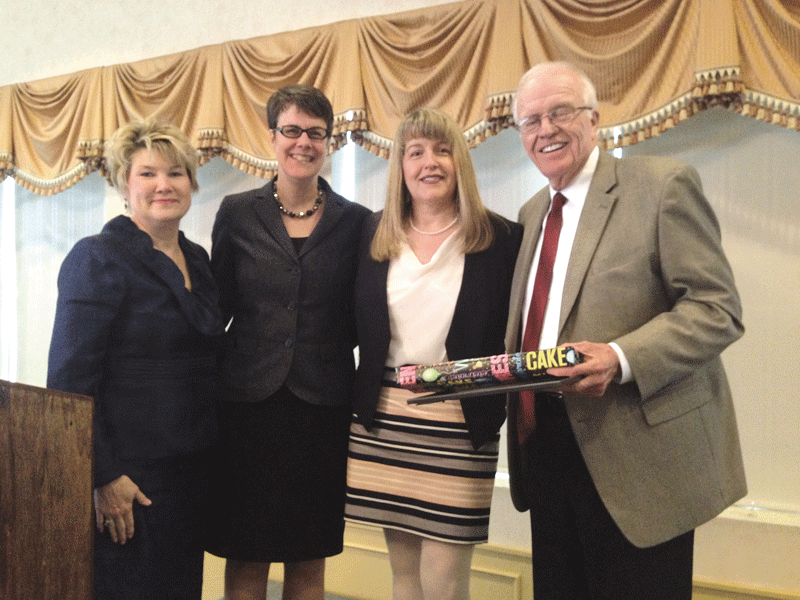 The event celebrated the progress made in re-entering the workforce by women from the Western Mass. Correctional Alcohol Center, also known as Howard Street, who have greatly benefited from the Dress from Success program. Honored that evening was Hampden County Sheriff Michael Ashe, whose office operates Howard Street, and who has been a long-time supporter of Dress for Success. Pictured from left are Kathy Tobin, director of Friends for the Homeless; Kate Kane, managing director of the Springfield office of Northwestern Mutual and president of the Western Mass. affiliate of Dress for Success; Sally Ruelli, Dress for Success Boutique director; and Ashe. 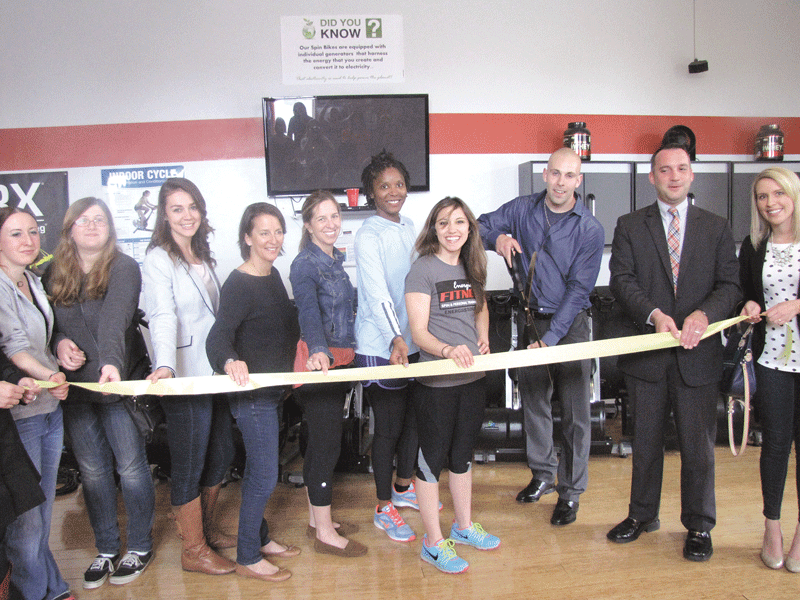 ENERGIA Fitness in Hadley recently held a ribbon-cutting ceremony to celebrate its new ownership. New owner Justin Killeen, third from right, joined Katie Lipsmeyer, ENERGIA manager, fourth from right; Don Courtemanche, director of the Amherst Area Chamber of Commerce, second from right; and ENERGIA employees at the celebration. Visit www.energiastudios.com for information on the center’s various classes and programs.